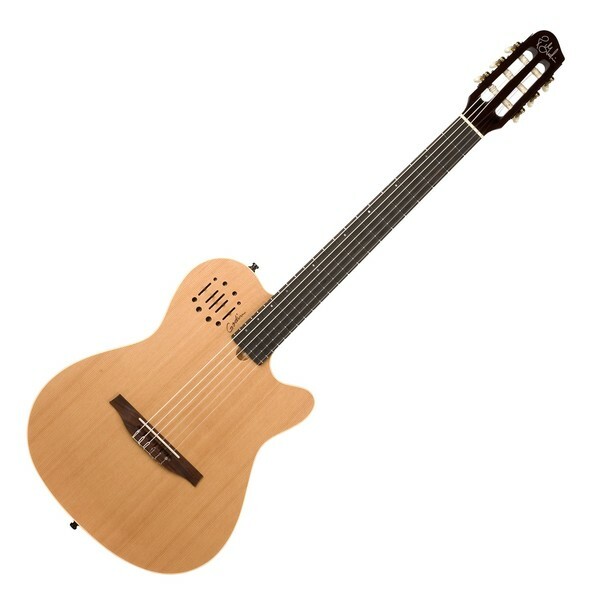 The Multiac Nylon Encore by Godin brings fantastic craftsmanship and high quality components together to make a fantastic electro acoustic guitar that is perfect for classical musicians who are looking to increase their arsenal. The Multiac Encore nylon string, also features a 25 ½ scale and a comfortable nut width, making it easy for electric steel string players to transition to nylon strings. This model features a chambered silver leaf maple body with a solid cedar top, as well as a dual source preamp with volume, treble, mid, bass and blend control sliders. Silver Leaf Maple body with cedar top.